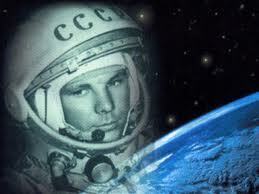 ANNIVERSARY OF THE FIRST MANNED SPACEFLIGHT BY YURI GAGARIN. 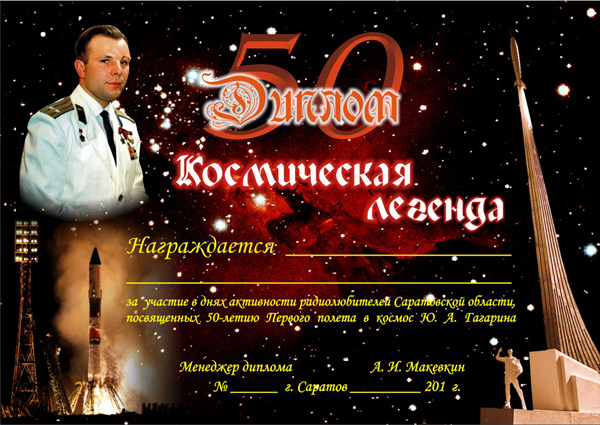 To commemorate this day in history – semicentennial of the first manned spaceflight by Yuri Gagarin, the Saratovskaya oblast radio amateurs organize the activity days. The radio amateurs worldwide are invited to join the activities. 1.Dates April 06, 2011 (beginning 0:00 ut) through April 12, 2011 (23:59 ut). 2.Bands: radio amateur HF bands, WARC, VHF – 144MHz, UHF – 430MHz. 3.Modes: CW, SSB, FM, digital modes. 4.The special event station will sign as RG50C from the site of the landing place of Yuri Gagarin throughout all the activity days. Gagarinskoe Pole and the special event award Kosmicheskaya Legenda 50. The conditions of the awards Volzhskie Dali, Gagarinskoe Pole can be read on the websites: www.ua4cgr.narod.ru, www.ua4cgr.qrz.ru. 6. To win the award Kosmicheskaya Legenda 50 one should score 50 points. = with hams from the Saratovskaya oblast and hams, SRVS members (the Military Officers Radio Amateur Union): 1 point. One station can be worked once on each band/mode. At operation only on the 160m band the points are doubled, on 2m and 70cm – tripled. within the period of 05.07 ut through 06.55 ut (timespan of the spaceflight of Yuri Gagarin), are tripled. SWLs can win the award at similar conditions. - Saratovskaya oblast hams and SRVS members must score 50 or more QSOs to get the award. - 40 RUR - junior club stations (club stations in the educational institutions). (the number of QSOs for the award is not limited). 7. Results of the activity days. (paper reports are also accepted) untill May, 15th 2011г. - Radio amateurs, SVRS members. c) the award Kosmicheskaya Legenda 50 to each operator of the prizewinning junior club station (1, 2, 3 place).